I'm back and healthy again. I had a horrible past week with flu symptoms (it was going around at Jason's work, so he got it first and I got from him) and spent 3 full days in bed. It was quite horrible and I couldn't do anything meanwhile. But, I kicked it without taking any medication! I'm just so happy that my appetite is back (actually even bigger than ever). 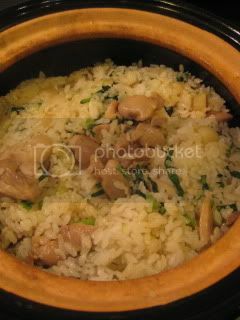 To celebrate my recovery, I made a donabe rice dish, which can become even a main dish with my double-lid donabe rice cooker, "Kamado-san". It's got chicken and kabu (Japanese turnip) with some yuzu kosho. Here's the recipe. 1. Cook the plain rice (with 2 rice-cups rice and 360 ml water) by following the general rice making procedure. 3. Add the diced kabu, and continue to saute for another minute. 4. Add the sake and soy sauce. Simmer for a few minutes. 5. Add the sliced kabu leaves and yuzu kosho. Stir for 1-2 minutes. 6. 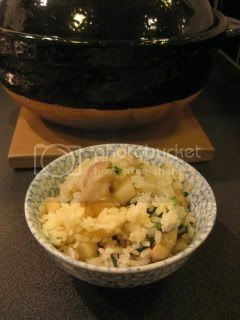 When the rice is ready, transfer the chicken/ kabu mixture to the rice in the donabe. Toss all the ingredients together. Serve immediately. The rice was so great with the subtle (and very effective) kick from yuzu-kosho flavor. 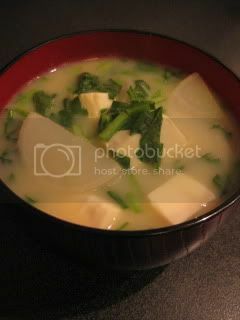 I served the rice with another kabu (plus kabu leaves) dish...I made kabu and tofu white miso soup. The soup was made with my soup & stew donabe, "Miso-shiru Nabe". It was so soothing and helped me recover even better.